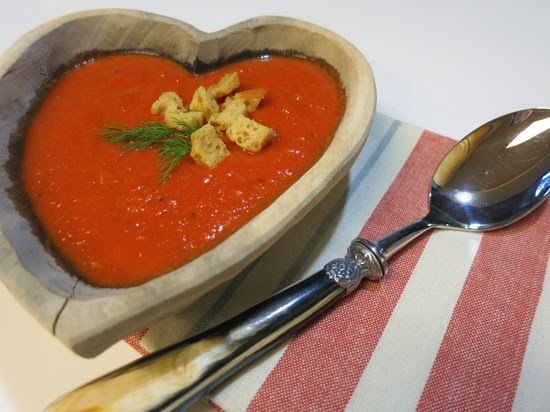 Eat Thrive Heal: Roasted Bell Pepper Soup..is it the yummiest soup? Roasted Bell Pepper Soup..is it the yummiest soup? Roasted red bell pepper soup has always been a favorite of mine. Just saying.. Put the olive oil in a soup pot and set the heat to medium. Add the onion and saute until translucent and softened. Add the roasted bell peppers, the thyme and the chicken broth and simmer for 20 minutes. Season with salt, pepper and balsamic. Serve with gluten-free croutons. To make your own gluten-free croutons, saute cut up pieces of gluten-free bread in a little olive oil, sea salt, pepper and Italian herbs. When croutons are golden and crispy, remove from stove and serve. You can always stir a little organic cream into this soup if you care to. I like mine the plain old anti-inflammatory dairy-free way for any regular night at home. But if I have guests to dinner, I'll splurge on the cream.